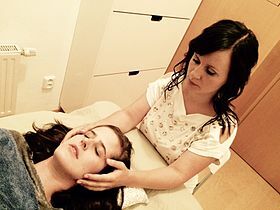 Craniosacral therapy (CST) is a form of bodywork or alternative therapy using gentle touch to palpate the synarthrodial joints of the cranium. A practitioner of cranial-sacral therapy may also apply light touches to a patient's spine and pelvic bones. Practitioners say that this palpation regulates the flow of cerebrospinal fluid and aids in "primary respiration". CST has been characterized as pseudoscience, and its practice called quackery. According to the American Cancer Society, although CST may relieve the symptoms of stress or tension, "available scientific evidence does not support claims that craniosacral therapy helps in treating cancer or any other disease". Similarly, cranial osteopathy has no scientific basis for any claimed benefit. Craniosacral therapy was developed by John Upledger, D.O. in the 1970s, as an offshoot osteopathy in the cranial field, or cranial osteopathy, which was developed in the 1930s by William Garner Sutherland. According to the American Cancer Society, although CST may relieve the symptoms of stress or tension, "available scientific evidence does not support claims that craniosacral therapy helps in treating cancer or any other disease". Cranial osteopathy has received a similar assessment, with one 1990 paper finding there was no scientific basis for any of the practitioners' claims the paper examined. In October 2012 Edzard Ernst conducted a systematic review of randomized clinical trials of craniosacral therapy. He concluded that "the notion that CST is associated with more than non-specific effects is not based on evidence from rigorous randomised clinical trials." Commenting specifically on this conclusion, Ernst commented on his blog that he had chosen the wording as "a polite and scientific way of saying that CST is bogus." Ernst also commented that the quality of five of the six trials he had reviewed was "deplorably poor", a sentiment that echoed an August 2012 review that noted the "moderate methodological quality of the included studies." Ernst criticized a 2011 systematic review performed by Jakel and von Hauenschild for inclusion of observational studies and including studies with healthy volunteers. This review concluded that the evidence base surrounding craniosacral therapy and its efficacy was sparse and composed of studies with heterogeneous design. The authors of this review stated that currently available evidence was insufficient to draw conclusions. The evidence base for CST is sparse and lacks a demonstrated biologically plausible mechanism. In the absence of rigorous, well-designed randomized controlled trials, it has been characterized as pseudoscience, and its practice called quackery. The therapist lightly palpates the patient's body, and focuses intently on the communicated movements. A practitioner's feeling of being in tune with a patient is described as entrainment. Patients often report feelings of deep relaxation during and after the treatment session, and may feel light-headed. While sometimes thought to be caused by an increase in endorphins, research shows the effects may actually be brought about by the endocannabinoid system. John Upledger devised CST. Comparing it to cranial osteopathy he wrote: "Dr. Sutherland's discovery regarding the flexibility of skull sutures led to the early research behind CranioSacral Therapy – and both approaches affect the cranium, sacrum and coccyx – the similarities end there." However, modern day cranial osteopaths largely consider the two practices to be the same, but that cranial osteopathy has "been taught to non-osteopaths under the name CranialSacro therapy." Practitioners of both cranial osteopathy and craniosacral therapy assert that there are small, rhythmic motions of the cranial bones attributed to cerebrospinal fluid pressure or arterial pressure. The premise of CST is that palpation of the cranium can be used to detect this rhythmic movement of the cranial bones and selective pressures may be used to manipulate the cranial bones to achieve a therapeutic result. However, the degree of mobility and compliance of the cranial bones is considered controversial and is a critically important concept in craniosacral therapy. From 1975 to 1983, Upledger and neurophysiologist and histologist Ernest W. Retzlaff worked at Michigan State University as clinical researchers and professors. They assembled a research team to investigate the purported pulse and further study Sutherland's theory of cranial bone movement. Upledger and Retzlaff went on to publish their results, which they interpreted as support for both the concept of cranial bone movement, and the concept of a cranial rhythm. Later reviews of these studies have concluded that their research did not meet enduring standards to offer conclusive proof for the effectiveness of craniosacral therapy and the existence of cranial bone movement. ^ "Why Cranial Therapy Is Silly". www.quackwatch.com. Retrieved 2016-10-21. Aronoff, George R., ed. (1999). Evaluation and Treatment of Chronic Pain (3rd ed.). Lippincott Williams and Wilkins. p. 571. ISBN 978-0-683-30149-6. Barrett, Stephen. "Why Cranial Therapy Is Silly". Quackwatch. Retrieved 16 December 2012. Norcross, John C.; Koocher, Gerald P.; Garofalo, Ariele (2006). "Discredited psychological treatments and tests: A Delphi poll". Professional Psychology: Research and Practice. 37 (5): 515–22. doi:10.1037/0735-7028.37.5.515. Bledsoe, BE (2004). "The elephant in the room: Does OMT have proved benefit?". The Journal of the American Osteopathic Association. 104 (10): 405–6, author reply 406. PMID 15537794. Hartman, Steve E (2006). "Cranial osteopathy: Its fate seems clear". Chiropractic & Osteopathy. 14: 10. doi:10.1186/1746-1340-14-10. PMC 1564028. PMID 16762070. Atwood, KC (2004). "Naturopathy, pseudoscience, and medicine: Myths and fallacies vs truth". MedGenMed. 6 (1): 33. PMC 1140750. PMID 15208545. ^ a b Ferré, J. C.; Chevalier, C.; Lumineau, J. P.; Barbin, J. Y. (1990-09-01). "[Cranial osteopathy, delusion or reality?]". Actualités Odonto-Stomatologiques. 44 (171): 481–494. ISSN 0001-7817. PMID 2173359. ^ "Craniosacral Therapy". UPMC Center for Integrative Medicine. 2012. Retrieved 19 May 2013. ^ a b Ernst, Edzard (2012). "Craniosacral therapy: A systematic review of the clinical evidence". Focus on Alternative and Complementary Therapies. 17 (4): 197–201. doi:10.1111/j.2042-7166.2012.01174.x. ^ Ernst, Edzard (2012). "Up the garden path: craniosacral therapy". Retrieved 15 December 2012. ^ a b Jäkel, Anne; Von Hauenschild, Philip (2012). "A systematic review to evaluate the clinical benefits of craniosacral therapy". Complementary Therapies in Medicine. 20 (6): 456–65. doi:10.1016/j.ctim.2012.07.009. PMID 23131379. ^ Jäkel, Anne; Von Hauenschild, Phillip (2011). "Therapeutic Effects of Cranial Osteopathic Manipulative Medicine: A Systematic Review". The Journal of the American Osteopathic Association. 111 (12): 685–93. PMID 22182954. ^ Agency for Healthcare Research and Quality (2012). "Best evidence statement (BESt). Craniosacral therapy for children with autism and/or sensory processing disorder". U.S. Department of Health & Human Services. Archived from the original on 7 October 2012. Retrieved 19 May 2013. ^ "Craniosacral Therapy". Blue Cross Blue Shield of Tennessee Medical Policy Manual. Blue Cross Blue Shield of Tennessee. 2012. Archived from the original on 2008-09-22. Retrieved 19 May 2013. ^ McPartland, JM; Mein, EA (1997). "Entrainment and the cranial rhythmic impulse". Alternative Therapies in Health and Medicine. 3 (1): 40–5. PMID 8997803. ^ McPartland, John M.; Giuffrida, Andrea; King, Jeremy; Skinner, Evelyn; Scotter, John; Musty, Richard E. (2005). "Cannabimimetic Effects of Osteopathic Manipulative Treatment". The Journal of the American Osteopathic Association. 105 (6): 283–91. PMID 16118355. ^ Greenman, PE; McPartland, JM (1995). "Cranial findings and iatrogenesis from craniosacral manipulation in patients with traumatic brain syndrome". The Journal of the American Osteopathic Association. 95 (3): 182–8, 191–2. doi:10.7556/jaoa.1995.95.3.182. PMID 7751168. ^ Upledger, John E. (2002). "CranioSacral Therapy vs. Cranial Osteopathy: Differences Divide". Massage Today. 2 (10). ^ Ferguson, A.J. ; Upledger, John E.; McPartland, John M.; Collins, M.; Lever, R. (1998). "Cranial osteopathy and craniosacral therapy: current opinions". Journal of Bodywork and Movement Therapies. 2 (1): 28–37. doi:10.1016/s1360-8592(98)80044-2. ^ Seimetz, Christina N.; Kemper, Andrew R.; Duma, Stefan M. (2012). "An investigation of cranial motion through a review of biomechanically based skull deformation literature". International Journal of Osteopathic Medicine. 15 (4): 152–65. doi:10.1016/j.ijosm.2012.05.001. ^ Upledger, JE (1978). "The relationship of craniosacral examination findings in grade school children with developmental problems". The Journal of the American Osteopathic Association. 77 (10): 760–76. PMID 659282. ^ Upledger, JE; Karni, Z (1979). "Mechano-electric patterns during craniosacral osteopathic diagnosis and treatment". The Journal of the American Osteopathic Association. 78 (11): 782–91. PMID 582820. ^ Green, C.; Martin, C.W. ; Bassett, K.; Kazanjian, A. (1999). "A systematic review of craniosacral therapy: Biological plausibility, assessment reliability and clinical effectiveness". Complementary Therapies in Medicine. 7 (4): 201–7. doi:10.1016/S0965-2299(99)80002-8. PMID 10709302.